CENTERVILLE, Mass. 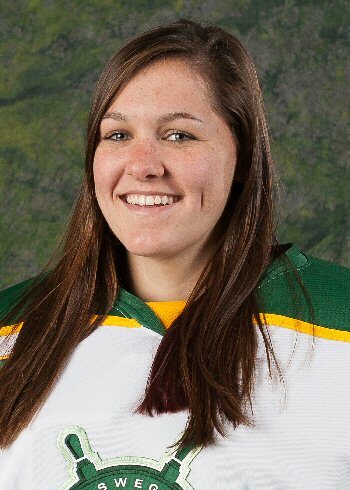 – Oswego State sophomore goaltender Bridget Smith (Hamburg, N.Y.) has been named the ECAC Women’s West Goaltender of the Week for the week ending November 12. Smith allowed one goal in two games against Potsdam to secure a series split for Oswego State. On Friday, Smith compiled 22 saves to earn her fourth career shutout in a 4-0 win. She allowed a lone power-play goal early in the first period of Saturday’s 2-0 loss, but went on to register 16 saves to finish the weekend with a .974 save percentage. The Lakers (2-3-1, 2-2-0 ECAC West) plays a weekend series at Neumann (2-1-1, 2-0-0 ECAC West) on Saturday and Sunday.